I know a few people that would love this. 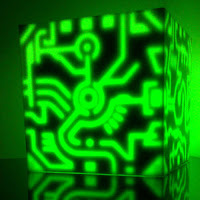 Parisian Greg Madison, inspired by such video game icons as Tron, The Legend of Zelda, and Final Fantasy, has created the Madylight: a cube with "luminescent shapes which represent electronic circuits or magic spells." The Instructable he created shows what goes into making one. As the comments below the article show, there are nearly countless options for what type of lamp you can create. The lamp is the first of many design Greg is looking forward to making. He makes sure to put the word out that he is "looking for firms which could be interested in producing and launching my creations like the following lamp." Good luck, Greg!